Waitz Corporation, formerly known as Jack Waitz & Company, was founded in 1952 by the late Jack Waitz. He was a pioneer in the awards and advertising specialty business and was one of the first entrepreneurs to see the value of combining the two. Glenn H. Wampole II, the founder’s step-son, is our current president. Glenn has over 40 years in the promotional products and awards fields. 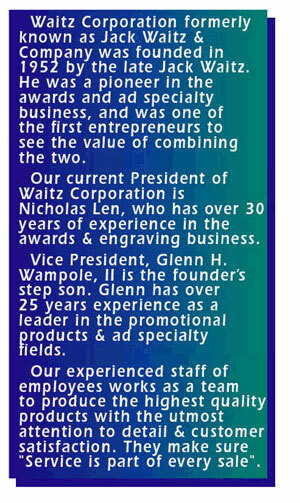 Waitz Corporation has an extensive range of awards and business gifts. We can custom design an award or gift to your specifications and meet almost any production schedule. Click on the “Awards” link for more detailed information. Our screen printing, etching and computerized engraving systems have produced thousands of custom identification nameplates for many manufacturers. The “Nameplates” link has information about Nameplates, Metalphoto, Etching, Engraving, Screen Printing and Decals. Use the “Way Finding” link if you are looking for Way Finding Signs, ADA Compliant, Badges, Desk or Wall Nameplates, Architectural Signs and Bronze Castings. Promotional products sales have grown due to their universal appeal to all businesses. We have a creative and experienced sales force backed up by in-house art and production capabilities that make us a leader in the field. Whether you are looking for a complete creative program, screen printed or embroidered wearables, or a standard promotional product let us give you the service you deserve. The search engine on our “Promotional Products” link will allow you to view thousands of products. “Select Brands” will show you our on-line preferred product catalogs. This provides an extensive list of links featuring the best products lines in our industry. Waitz Corporation is a member of the Premier Group, the industry’s largest promotional products purchasing group. Membership gives our clients an edge on pricing, product choice and service which are unmatched in the promotional product industry.